To create the best chance of having profitable trades, OmiCronFX uses the Mandelbrot algorithmic routine in two ways: (1) as a tool for carrying our research and (2) as the means by which the actual trades are placed and managed. To achieve success in trading, it is essential to create a situation where probability is on your side. The Kelly Criterion is a mathematical formula that was developed by J. L. Kelly Jr. in 1956, for use in sports betting. It uses the possibility that the bettor may be able to determine that an edge exists over the odds that are offered for a particular outcome. As an example, consider a series of horse races where the person placing the bets is able to calculate that a particular runner has a better chance of winning than the official odds would suggest, over a large number of races. Then the person placing the bets has an edge. 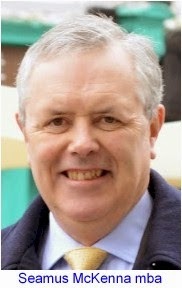 The Kelly formula relates that edge to the odds so that the desirability of placing a proportion of the amount available on the horse in increased. To apply the Kelly Criterion to Forex, OmiCronFX makes some assumptions. One is that the odds of an outcome are equal to the historical record of the number of profitable trades over a period, given as a percentage of the total number of trades taken. For the same trades, the edge is the ratio of the cash value of the profitable trades to the cash value of the losing trades. The principle is shown in the illustration at the top, where we used this idea to analyse trading on the first trading day of each month for the first half of 2015. There were no market moving scheduled reports on these days, so we wanted to determine the desirability of even being in the market at all. We ran Mandelbrot with its standard criteria set on historical data for each of the first monthly trading days. There were a total of 16 trades taken. For the London session, 6 out of 8, or 75%, were winners. In the NY session, 4 out of 8, or 50%, were winners. For the same trades, the cash value of the profits in the London sessions were over three times those of the losses. In the New York session losses actually exceeded profits. 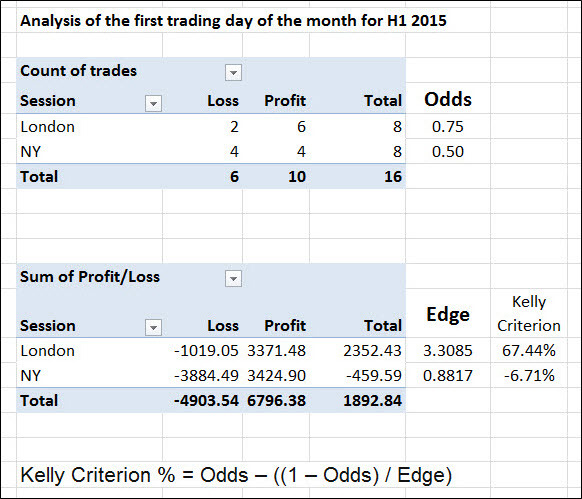 Putting all of the outcomes together in the Kelly Formula provided a Kelly percent outcome of 67.44% for the London session on the first trading day of the month, and a negative 6.71% for the New York session. The Kelly rules say that when the percent outcome is negative, no position should be taken, so we would not trade the New York session on the first day of the month. The London session outcome indicates that it should be traded, and Mandelbrot did indeed take a position at the London open yesterday.